Municipality of Hunters Hill celebrates INDEPENDENCE DAY! 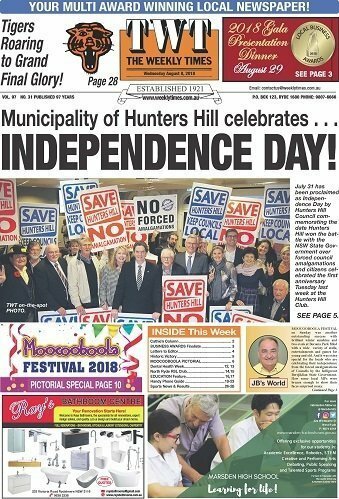 July 31 has been proclaimed Independence Day by Hunters Hill Council, marking the date it defeated the NSW Government over forced council amalgamations. Civic leaders were joined by citizens to celebrated the first anniversary last Tuesday at the Hunters Hill Club. 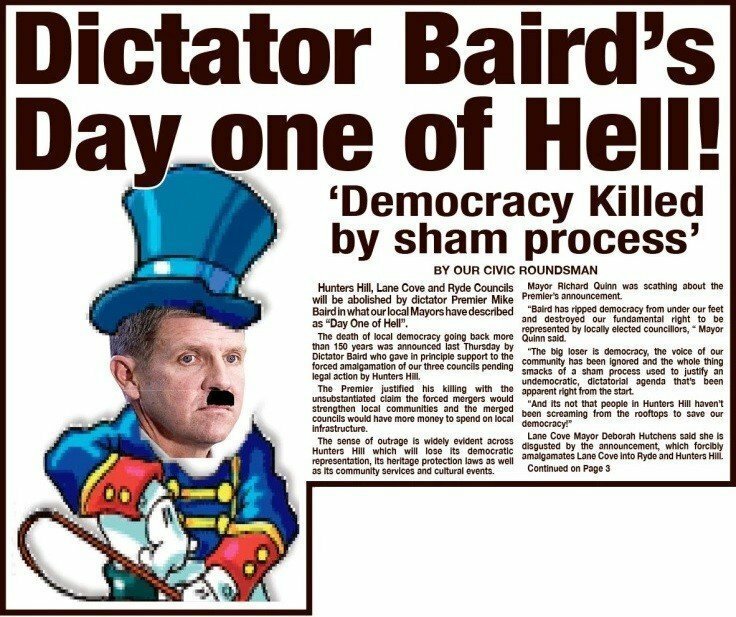 WEEKLY TIMES was also praised for its role in the historic victory against the defeat of the Berejiklian Government – then Baird Government – dictatorship’s proposed forced merger between Hunters Hill, Lane Cove and Ryde. Hunters Hill Mayor Mark Bennett told the celebration that it was the “ferocious opposition” by The Weekly Times that played a crucial role in forcing the government backdown. 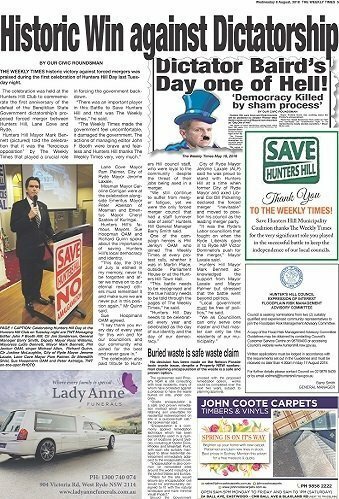 “There was an important player in this Battle to Save Hunters Hill and that was The Weekly Times,” he said. Lane Cove Mayor Pam Palmer, City of Ryde Mayor Jerome Laxale, Mosman Mayor Caroline Corrigan were at the celebration alongside Emeritus Mayor Peter Abelson of Mosman and Emeritus Mayor Cheryl Szatow of Kuringai. Hunters Hill’s famous former Mayors Sue Hoopman OAM and Richard Quinn spoke about the importance of saving Hunters Hill’s local democracy and identity. “This day, the 31st of July is etched in my memory, never to be forgotten and after we move on to our eternal reward others must remember it and make sure we are never put in this position again,” Mr Quinn said. The celebration also paid tribute to Hunters Hill council staff, who were loyal to the community despite the threat of their jobs being axed in a merger. 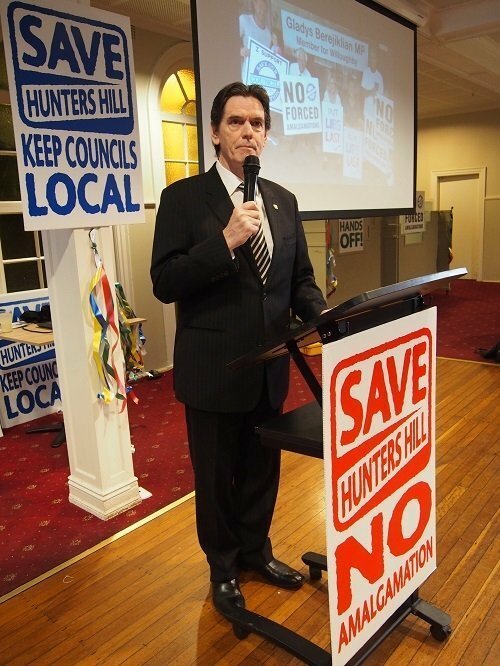 “We still continue to suffer from merger fatigue, yet we were the only forced merger council that had a staff turnover rate of zero!” Hunters Hill General Manager Barry Smith said. One of the campaign heroes was Phil Jenkyn OAM who joined The Weekly Times at every protest rally, whether it was in Martin Place, outside Parliament House or at the Hunters Hill Town Hall. “This battle needs to be recognised and the true history needs to be told through the pages of The Weekly Times,” he said. City of Ryde Mayor Jerome Laxale (ALP) said he was proud to stand with Hunters Hill at a time when former City of Ryde Mayor and axed Liberal Col Bill Pickering declared the forced merger “inevitable” and moved to position his council as the leading merger party. “It was the Ryde’s Labor councillors that fought on when the Ryde Liberals gave in to Ryde MP Victor Dominello’s push for the merger,” Mayor Laxale said. Hunters Hill Mayor Mark Bennett acknowledged the support from Mayor Laxale and Mayor Palmer but stressed that the battle went beyond politics. 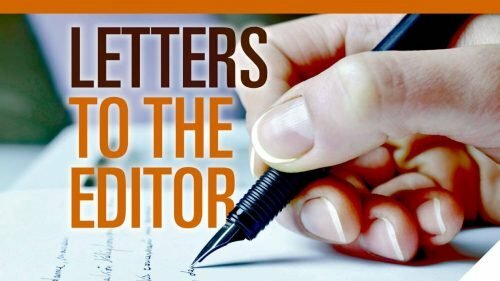 “Local government must be free of politics,” he said.